Finding Nemo – These Two Eyes! If you’ve been to the Caribbean, a common pastime of east coasters, you may or may not know that there are about 40 species of fish you can encounter while snorkeling through its tropical blue water. 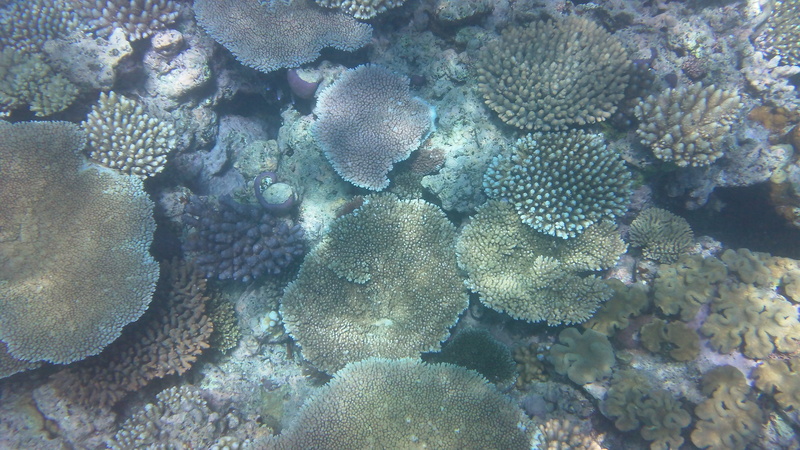 The Great Barrier Reef has over 400. This made my odds of finding Nemo a lot more in his favor. Another fun fact: The Great Barrier Reef, or what I like to refer to as the GBR, is the only living thing that can be seen from space. It’s true. Stinger season is in session! One may perceive Cairns (pronounced ‘cans’), Queensland’s gateway to the GBR, to be filled with long sandy beaches and palm trees swaying amongst coconut groves. But interestingly enough, you cannot swim in Cairns. 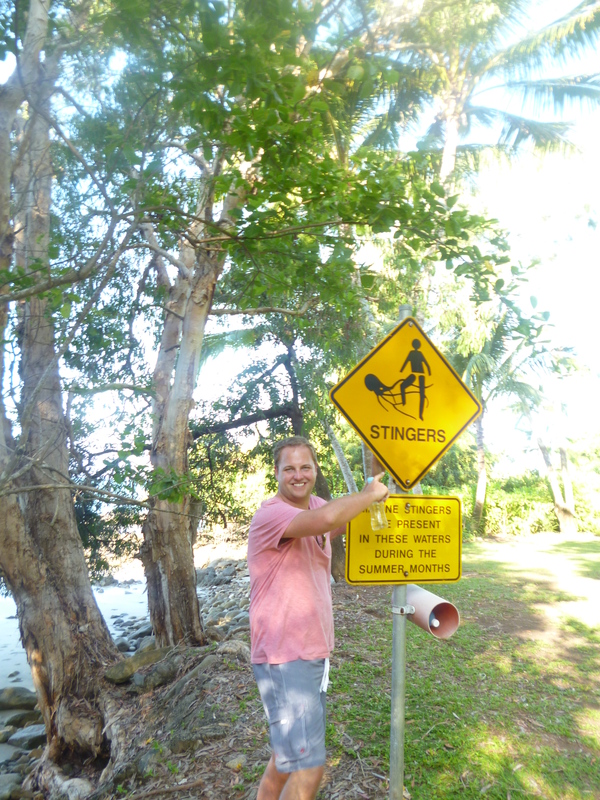 The beach is sanctioned off in the center of the city as the odds of getting stung by a jellyfish known as a stinger, or crossing paths with a saltwater crocodile, are high. Instead they built a manmade lagoon, with sand and palm trees and public toilets and the works, directly next to the ocean. 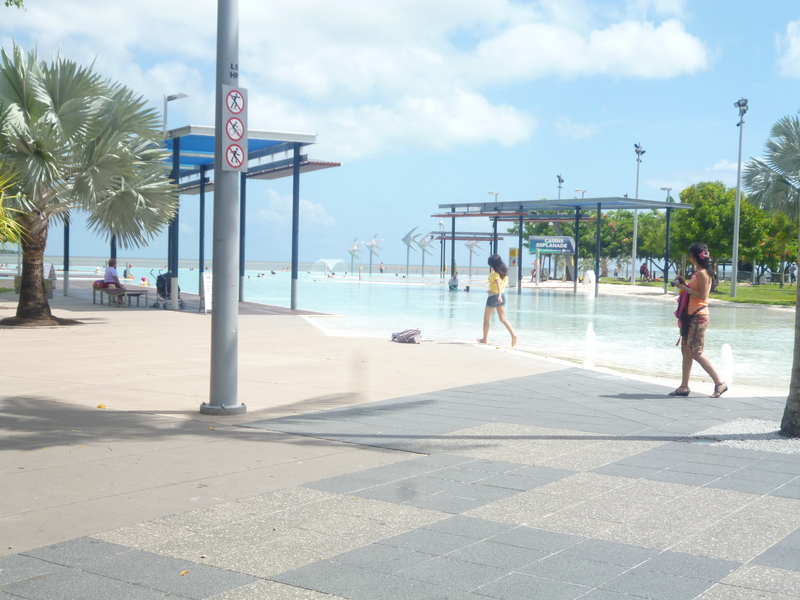 It’s basically a big public pool with not as much of the skeevy jeevies that you would get in an inner city public pool because the sun is shining brightly and you’re looking at a beautiful ocean – the gateway to the GBR people. 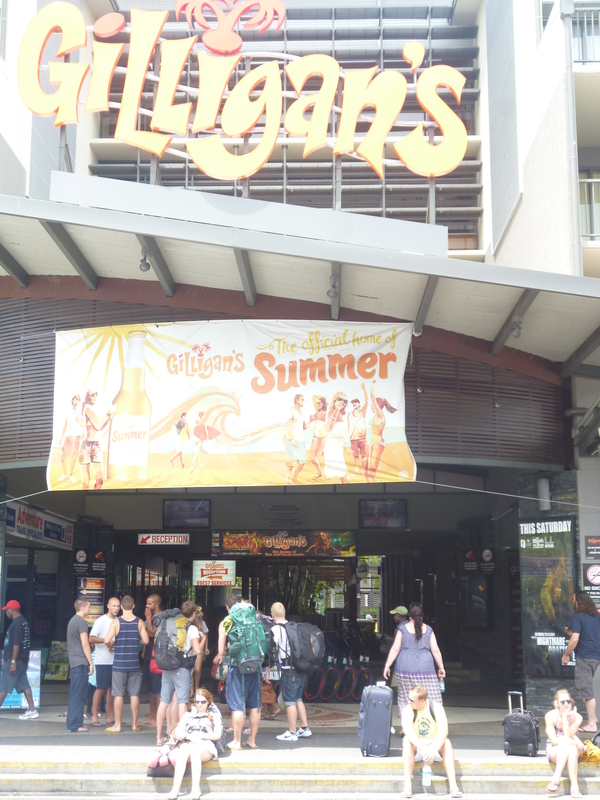 The city of Cairns is a crossroads of tourist shops, tourist restaurants, and tour companies. It’s a town that thrives on tourism. It’s also a town full of backpackers. No trip would be complete without a night out a Gilligan’s, hostel slash club, with friends Diana and Sean who trekked all the way across the world from sunny Arizona and cold weather turning New York. Stepping out from the airport and into the lobby, flashbacks of being there exactly one year to the date got me excited for what was ahead. I was in horror when I heard the Macarena played later on out on the patio bar, not because I’m a Cha Cha Slide advocate, but because who seriously plays the Macarena in 2011? It was nothing an inevitable stop off at Pie Face wouldn’t cure. We ended the night with Sean and I, what we thought was whispering, doing calculations of the time difference on his iPhone to set the alarm for the early rise to Port Douglas in the morning. So, although Cairns is characteristically the gateway to the GBR, recommendations from friends advised that because of the masses of tourists, the part of the reef most often visited from the Cairns jump off point is fairly damaged and less exotic. 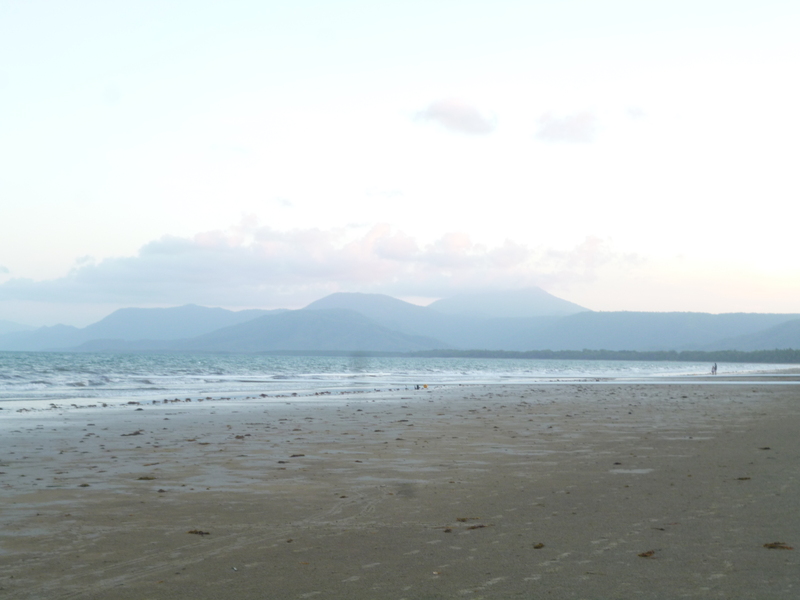 That just meant I could have an excuse to visit somewhere I haven’t been before, beautiful Port Douglas. All the guide books say that Port Dougie is where the celebs and fancy pants rich people like to go. It’s also where laid back hippies and backpackers on no sort of time allotment go too. We didn’t fit into either of those categories however decided to journey the hour north, sandwiched between the coast on our right and the Daintree Rainforest on our left. Arriving in Port Dougie I wasn’t sure what to expect. Strung along Four Mile Beach sit exclusive beach havens mixed amongst low budget rooms for rent. The town is a strip of high end restaurants serving fresh fish and relaxed pubs with cover bands. There are two gelaterias. There are also a handful of tourist shops and tour companies. Apparently back in the day Port Douglas used to be the biggest port that far north, now its Cairns. Regardless the whole vibe of the town screams relaxation station. We pull in to Dougies, what a place. Firstly, they provide a free bus from Cairns all the way up the coast. They’re a five minute walk to the beach, and a twenty minute walk into town. On first impression I see people reading books in canvas hammocks hanging from palm trees, knapping on wooden beach recliners and cooling off from the scorching heat in the pool. 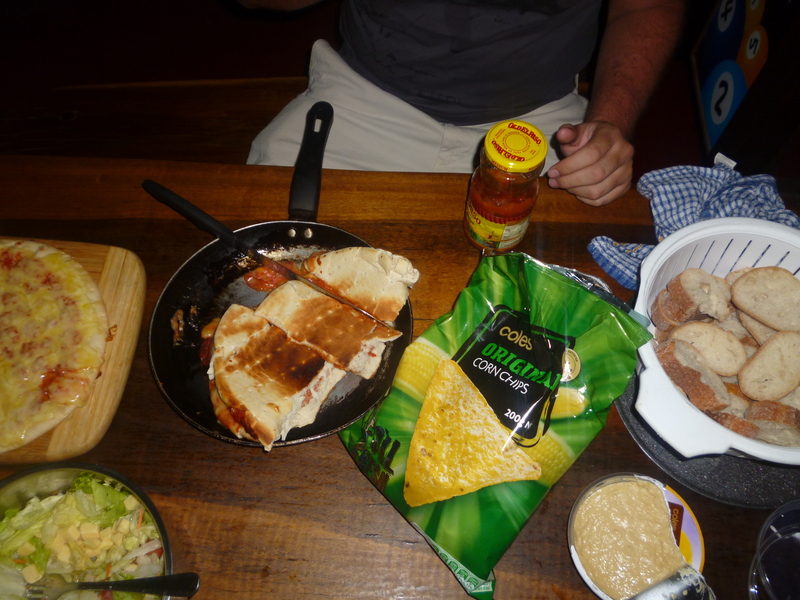 We got escorted to our 3 person room, tv and air con a plus, and walk through the lounge where Jack Johnson plays in the background, the aroma from couples cooking lunch in the large kitchen fills the room, as a few young backpackers play Snooker in the corner while drinking $9 pitchers of beer. I decided at that moment that life was awesome. For about $1 an hour we rented bikes from the friendly staff and rode fifteen minutes or so, away from town, to the Wildlife Habitat. Sean was on a mission to feed a kangaroo and damnit we were gonna see some roo! The combination of hangover, coupled with 90 degree heat, coupled with what I thought was going to be a leisurely bike ride turned strenuous, had me on the verge of passing out. Luckily there was a cheap sausage sizzle happening at the grocery store next to the park. For those who don’t know what a sausage sizzle is, it’s basically sausages from the grill thrown in a piece of bread, and can often times be organized to raise money for charity or provide cheap eats. Right, Gatorade and sizzle, I’m ready to feed some roo. Entry to the Wildlife Habitat costs a steep $32 but we deemed it worth it since we booked a cheaper snorkel trip for the following day. 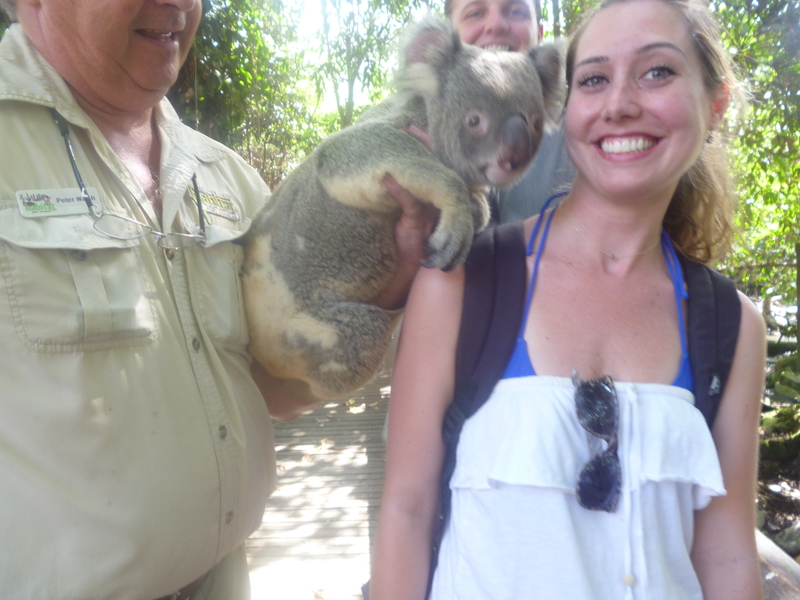 Plus, this was Sean and Diana’s one shot to see a live kangaroo and Koala. We arrived just in time for the Koala presentation where we learned heaps, a very commonly and overused Australian slang for “lots of”, information about the cute creatures. Yes, they bite. Yes, they are known for getting Chlamydia, and yes they are native to Australia because they only eat Eucalyptus, which is poisonous too them if they intake too much. So much for “cute”. After the Koala presentation we stuck around to pet a baby crocodile while learning about the key differences of that and the American alligator. Considering saltwater crocs have been known to be found in the ocean from time to time, I inquired about who would win a croc-shark showdown. May the bigger man win it seems, however, put one of each equally qualified in a tank and then let’s see what goes down. The layout of the place was well organized, as were the animal presentations, so when we took our bag of roo feed over to the grasslands area to see the little hopping guys in action, boy were we surprised! Firstly, attack of the birds! Holy moley, these birds knew when we opened the gate that people meant food, and with that, these birds meant business. Next thing I knew I was on one side of the park avoiding the masses while Diana and Sean were on the other. I found myself face to face with the largest kangaroo I’ve ever seen, and he just stood there, for a long long time. He must have been 4 foot high. He was definitely alive, but he didn’t move much. 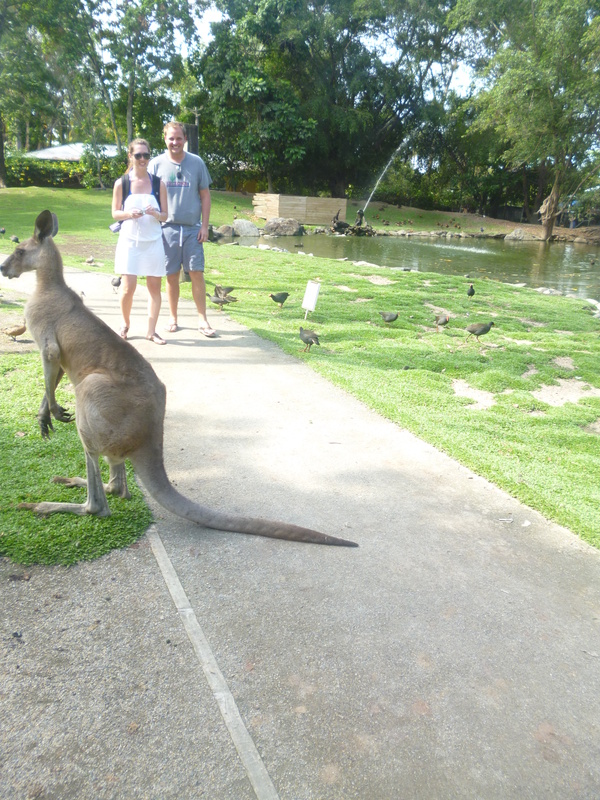 He was either as zoned out as the hippies who frequent Port Douglas, or was just as much trying to avoid the annoying birds as I was. The largest Kangaroo in the world! After a chilled out evening and early rise, I was finally ready to go find Nemo. We booked our snorkel and intro dive tour on Calypso, one of the popular tour companies in the area. 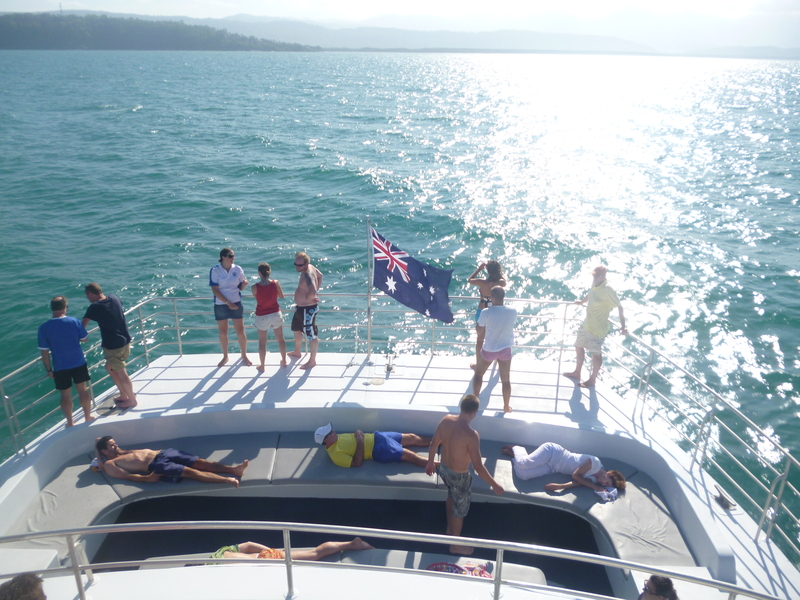 Rushing to get prime seating of reclining chairs on the top deck, we lubed up on sun screen as we headed an hour and half so away from mainland into the outer reef. Sean and Diana bravely attempted their first ever scuba dive down to the bottom of the coral floor, while I contemplated way too long to wear a wetsuit before nervously jumping in to snorkel solo until they returned. We stopped at two more reef sites where I saw amazing things like giant clams the size of a small child, coral in every color of the rainbow, and most excitingly, a sea turtle! He just was super chilled out as he swam his way past our group and let us follow him along the reef. I have to give Calypso props for their professionalism on the water, knowledge base of the reef, and beer selection for the ride home. We had another quick wander through town just as the sun was setting and the bats started to come out for the bat party. Now, there are bats here in Brissy, I see them from my balcony, but up in Cairns and Port Dougie there is a serious bat coven happening. Right at dusk and dawn you will begin to hear them screeching, tons of them, and if you look up the sky just swarms with them – all on their way to the bat party I suppose. To add to the odds of random things we encountered all weekend, freakishly tall roos and bat parties included, with exhaustion from the sun we decided to pick up some pizzas and have a quiet one in the lounge. To our surprise, as the place was crawling with backpackers who apparently didn’t seem to be leaving anytime soon, we had assumed the kitchen was equipped with an oven. Nope. Its 7 pm on a Sunday night, we’re in Australia, we’re in very rural Australia, our options of things being open are slim to none. Time to improvise. Sean attempts to cook the pizza in a frying pan over the stove. I slice bread and serve it out of a spaghetti strainer. Diana mixes salad into a soup pot. We have one fork to share. As the pizza cooks we notice the invisible ants that seem to be crawling everywhere in the place. A cockroach shimmies across the counter. We pour salsa in a pot lid to dip our chips in. Don’t worry, this $9 pitcher round is on me. But the big question is should I have it with the delicacy of pepperoni and ants or cheese and mosquito? Mmm, exquisite. So after reading this whole long big entry your insides must be screaming, but did you ever see Nemo? I did, I saw him, a few of him actually and of bunch of other amazingly looking fish. I went to bed Sunday evening spraying around my bed with insect repellent and journeyed back to Cairns the next day to hang by myself at the lagoon while Diana and Sean drove down to the Whitsundays. It was a weekend I expected to just be a quick fling to the GBR but in the end it turned out to be a true a vacation, alas. 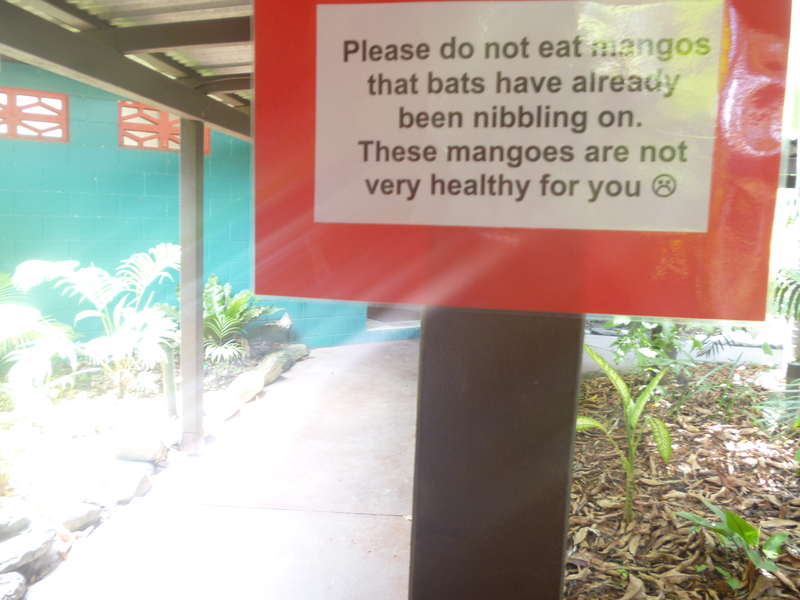 You would think with all the bats the ants and mosquitoes would be taken care of.